I am in-between gardening events. I caught one Chipmunk Raider, I re-baited the hav-a-hart traps, and I wait. I pickled 19 pints and 9 quarts of pickles over the weekend. The tomatoes are still thinking seriously about ripening. I haven’t found pignoli nuts yet, and so I cannot put up pesto. What is a gardener to do? Share her toys! I have a few tools that are, I believe, unfamiliar to most American gardeners. They are promoted by Eliot Coleman, who is described on the back cover of “The New Organic Grower” as “a garden tool consultant.” Mr. Coleman is my hero, and his wonderful writing plus his artistry combined with common sense has brought me a beautifully built garden, and an abundance of healthy food. One tool he recommends enthusiastically is a soil block maker. This tool is a metal frame of cubes that you press into moist potting mix, turn the frame 180 degrees and lift up. You position the soil block maker over a tray, or wherever you want your soil blocks to rest, and push down on a spring-loaded press. Perfect, square blocks of soil emerge, complete with dibbled holes waiting for seeds. The advantage of a block of soil is that the air around the block provides “walls.” The growing roots sense the air and stop growing. They do not circle the inside of a pot, becoming root bound. The roots wait patiently, and as soon as you transplant the block into the garden, the roots leap into the ground, and your seedling is firmly established. 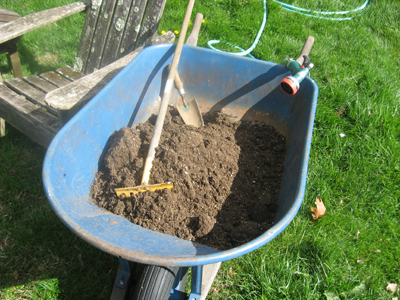 I made my potting soil in the wheelbarrow. 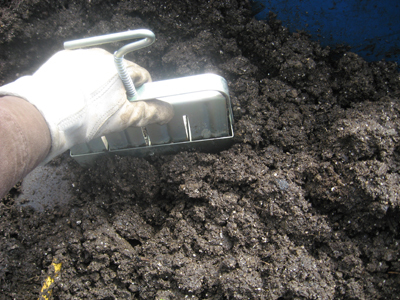 It included peat, greensand (for potassium), cottonseed meal (for nitrogen), phosphate rock (for phosphorous of course) and a bucket of garden soil. I added water until the mix was the consistency of new play-doh. A child-size rake, a trowel, and the garden hose are perfect for mixing potting soil. 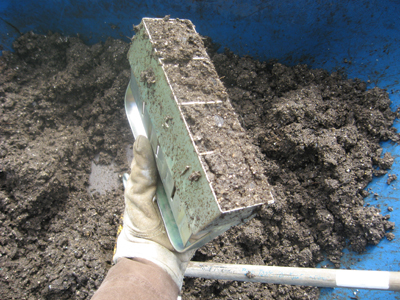 I pressed the soil block maker firmly into the mix and turned it 180 degrees. Lift, and show the camera! 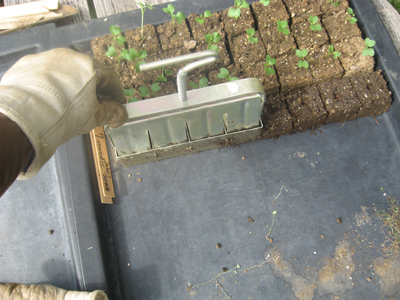 I positioned the soil block maker over my seedling tray and pressed down on the plunger to release the soil blocks. Everyone has his or her own definition of beauty. 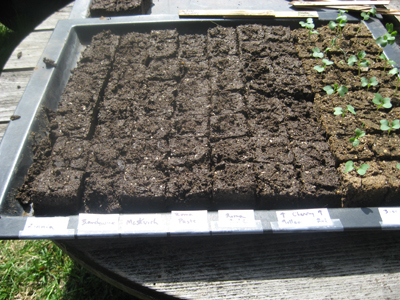 One of mine is the sight of a tray filled with blocks of soil, waiting for seeds. I know the soil is filled with food and water. My seeds will germinate and grow. This gratified feeling is akin to presenting well-prepared food to your family, making the guest bed with pretty, scented sheets for friends, or listening intently to a child. I provide. I care for you. I will start you off well, and nurture you along the way.